Put Spring in your step and wear a blooming bouquet on your wrist with the Pink and Purple Field of Flowers Murano Charms. 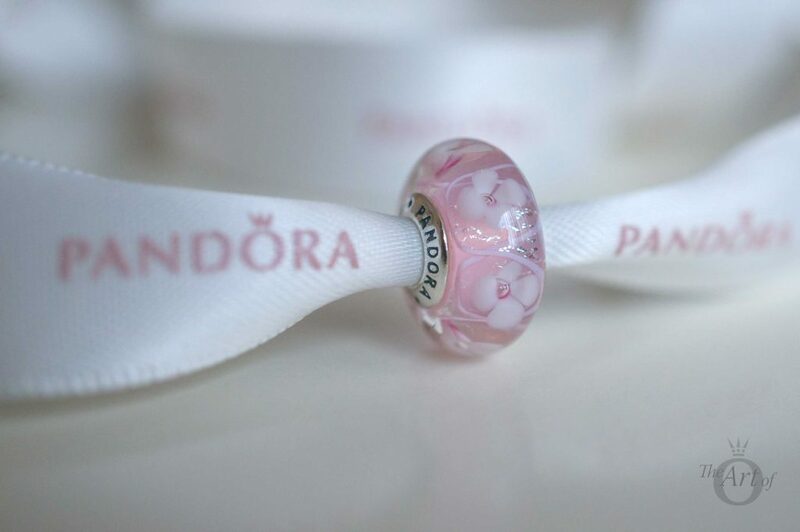 PANDORA fans have gone gaga for the floral frenzy that is the PANDORA Field of Flowers Murano Charm. 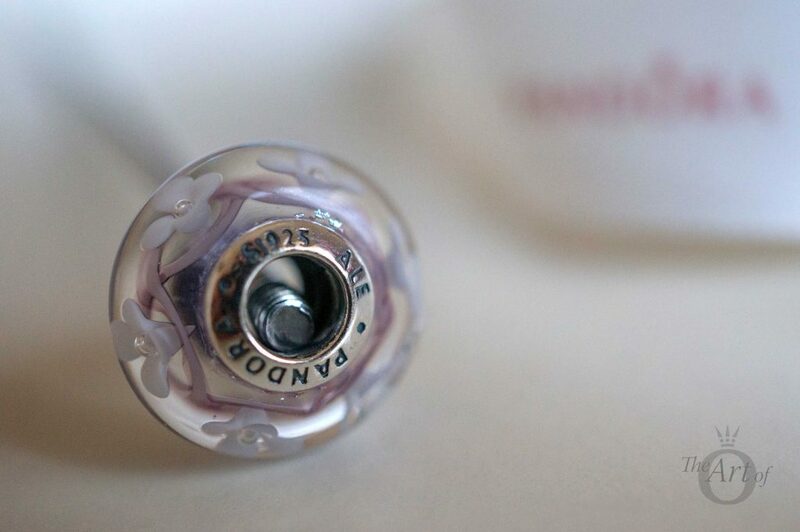 The Murano, also known as the Bloom Murano Charm is available in Purple (No. 791667), Pink (No. 791665) and Blue (N0. 791666). 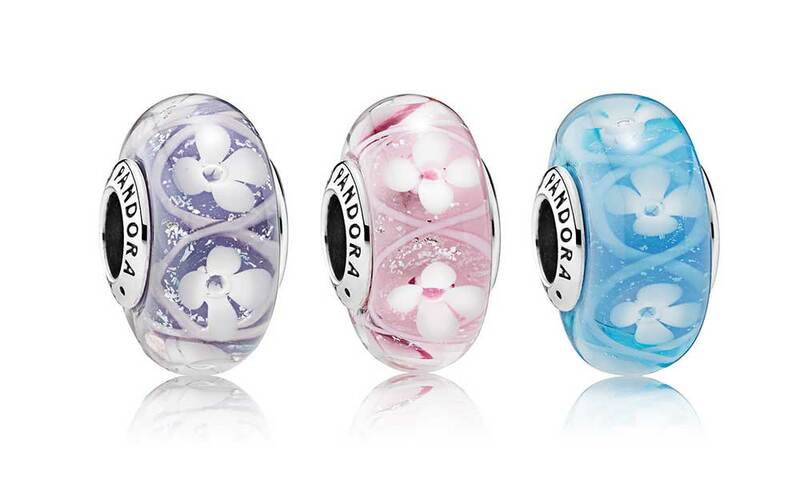 The Blue PANDORA Field of Flowers Murano Charm is only available in Europe and the UK. 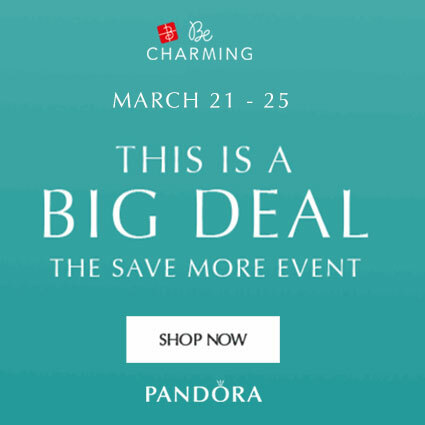 PANDORA is getting more and more creative with their Murano Charm designs and the Field of Flowers Murano Charms were a highlight of the PANDORA Spring 2017 Collection. 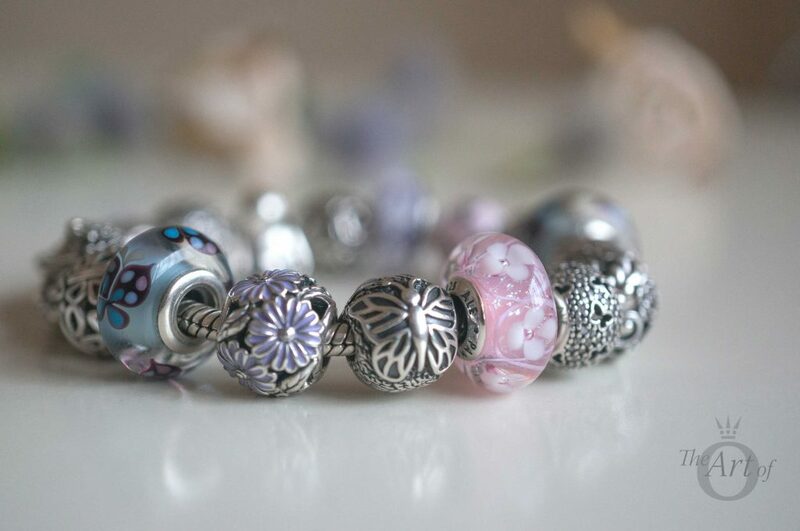 I think the Purple, Pink and Blue PANDORA Field of Flowers Murano Charms forge a fresh, bold look. 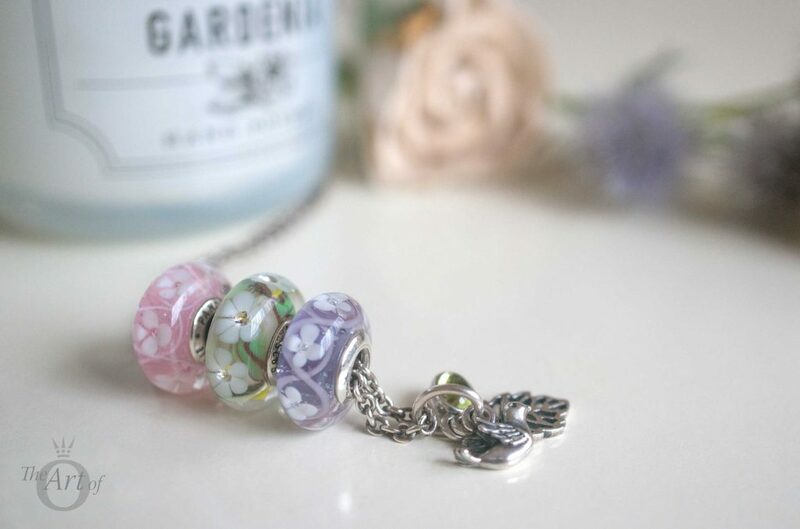 The Pink and Purple Field of Flowers Murano Charms are my favourites and I will be reviewing them together. The PANDORA Field of Flowers Murano Charm has quite an intricate design made up of a swirling ribbon, white flowers and shimmering glitter. Iridescent glass create a mesmerising water droplet effect on the top of each flower. 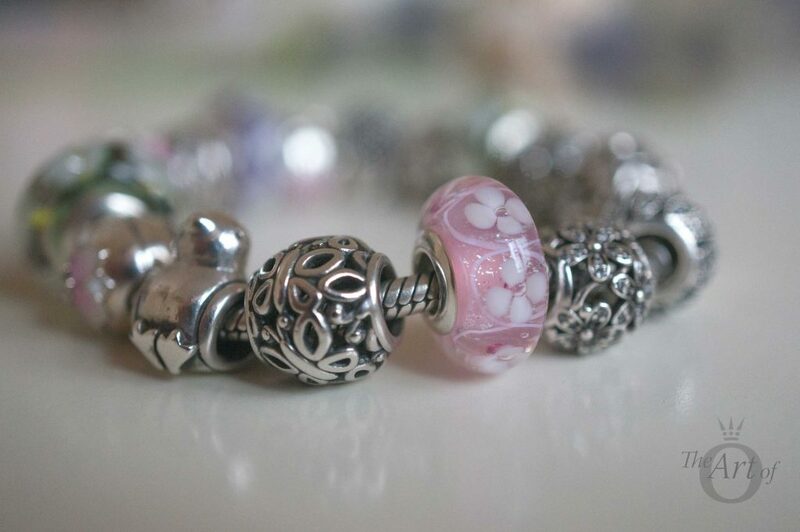 From the side view of the PANDORA Field of Flowers Murano Charm you can see the layering technique used to produce this stunning Murano. It really is a work of art. 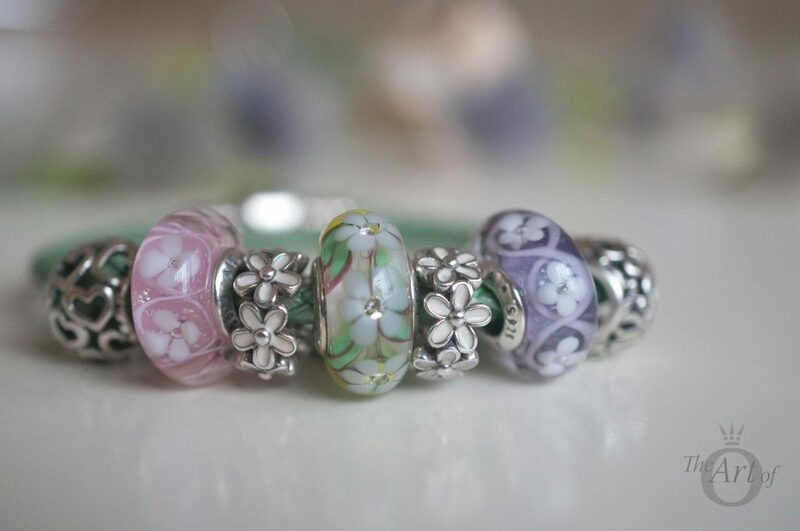 Despite being the same design, the PANDORA Field of Flowers Murano Charms will vary slightly as a characteristic of the production method. 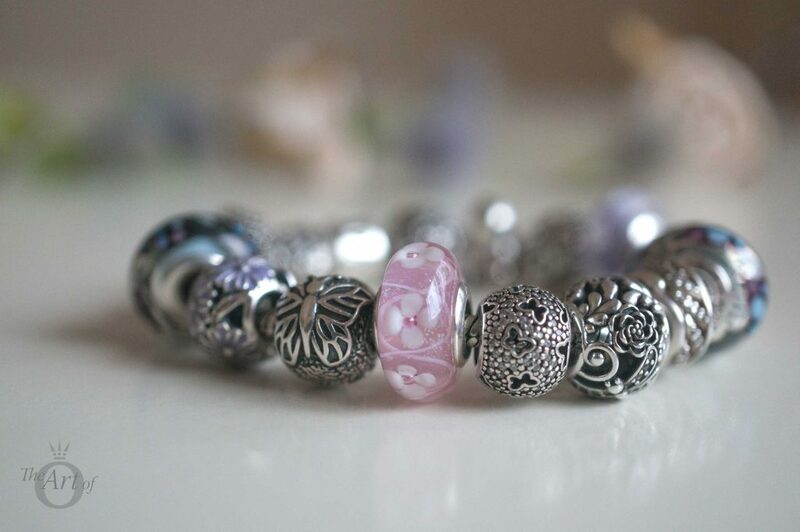 Each PANDORA Murano glass charm is unique and can contain small variations in the design, colouring and size. 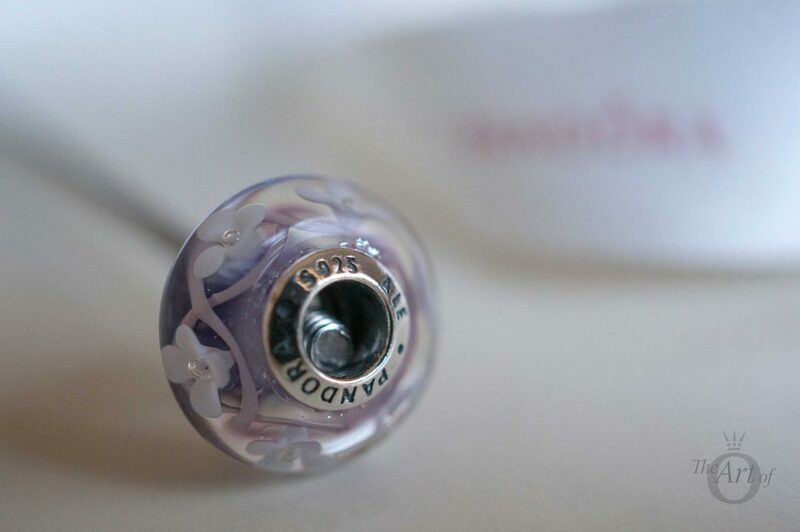 The swirling ribbon in my Pink Field of Flowers Murano is thinner than in my Purple Murano. The Pink Field of Flowers Murano appears to have slightly more glitter than my Purple Murano, although it may be that as the ribbon is thinner, more background and glitter is visible. 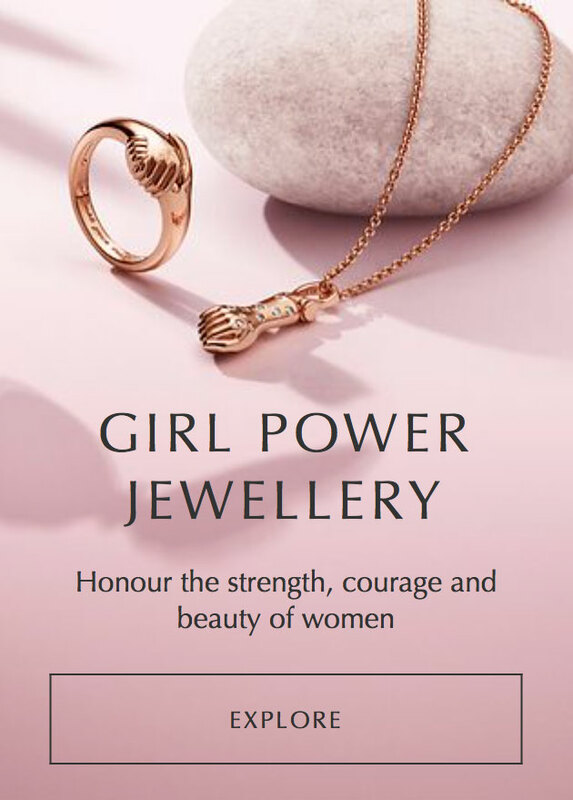 The variations in each PANDORA Murano Charm shouldn’t be viewed as a fault, but rather it emphasises the high degree of handcrafting involved in forming the Murano. 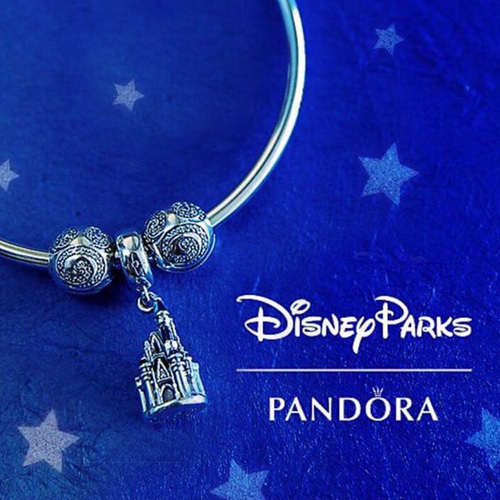 As PANDORA says, “Unique is in the detail”. For my first styling I used the Pink Fluttering Butterflies (No. 791483en68), White Primrose Meadow (No. 791488en12) and Lavender Daisy Meadow (No. 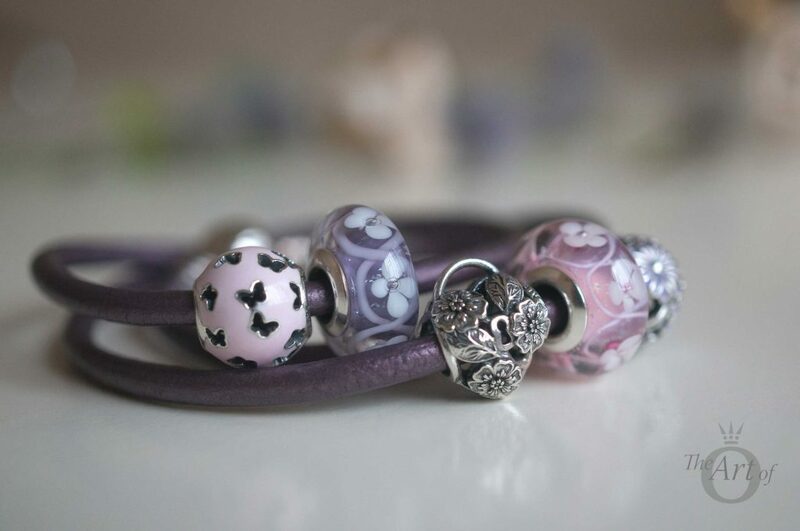 791487en66) charms with the Pink and Purple PANDORA Field of Flowers Murano Charms. 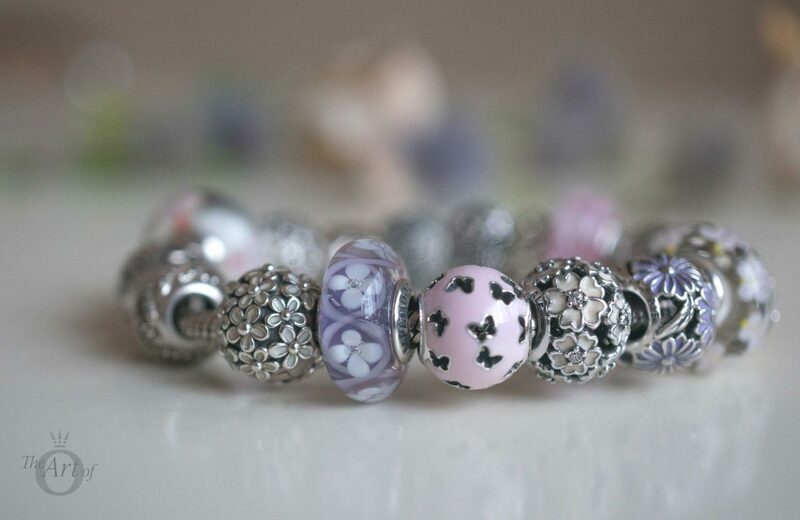 The pink and purples are a perfect match with the Murano Charms. The Lacewing Butterfly Clips (No. 791256) are a fitting finish for this design. 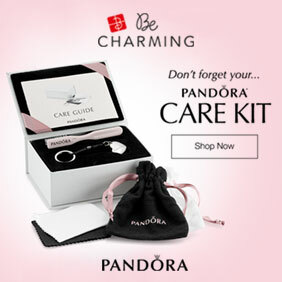 One of the things I love most about PANDORA Murano Charms is how diverse they are. Simply adding a Murano Charm or two to a necklace with a Pendant Charm can create a completely new look. 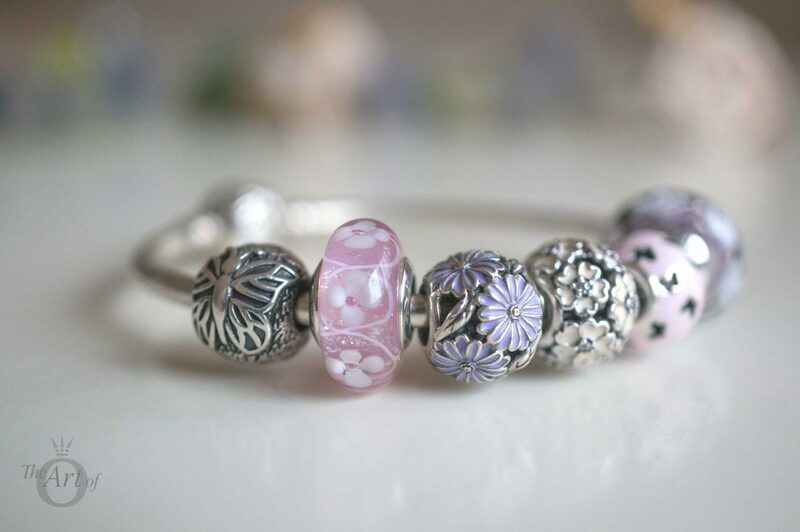 I adore the Pink and Purple PANDORA Field of Flowers Murano Charms with the Wildflowers Murano Charm (No. 791638cz) and the Forest Trinity Dangle Charm (No. 791214pe). 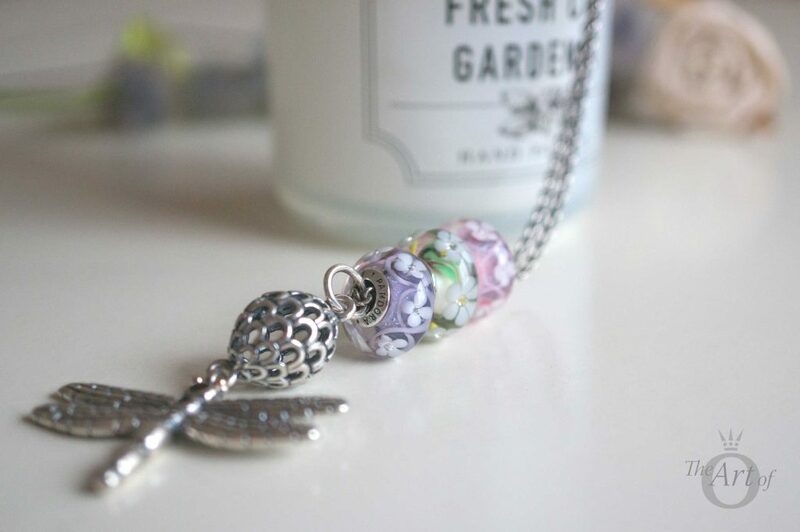 The PANDORA Field of Flowers Murano Charms work equally well with larger pendants like the outstanding Dragonfly Pendant (No. 390336czk). 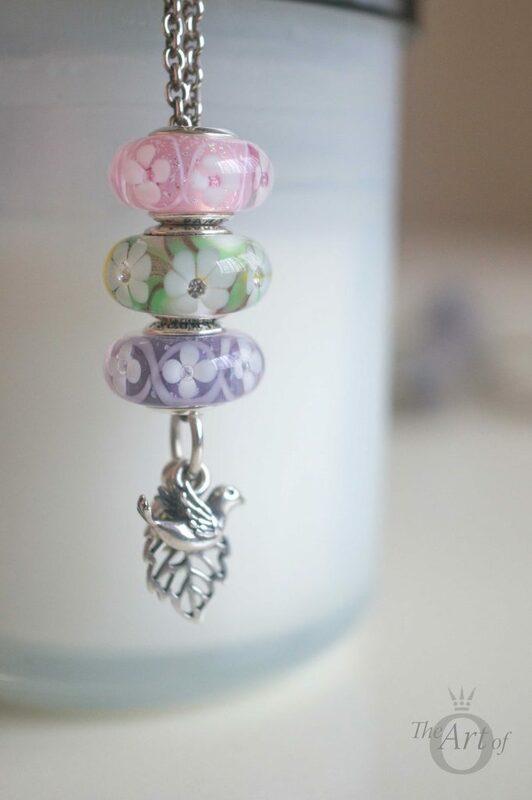 In this design I alternated the Pink and Purple PANDORA Field of Flowers Murano Charms with two Wildflowers Murano Charms. 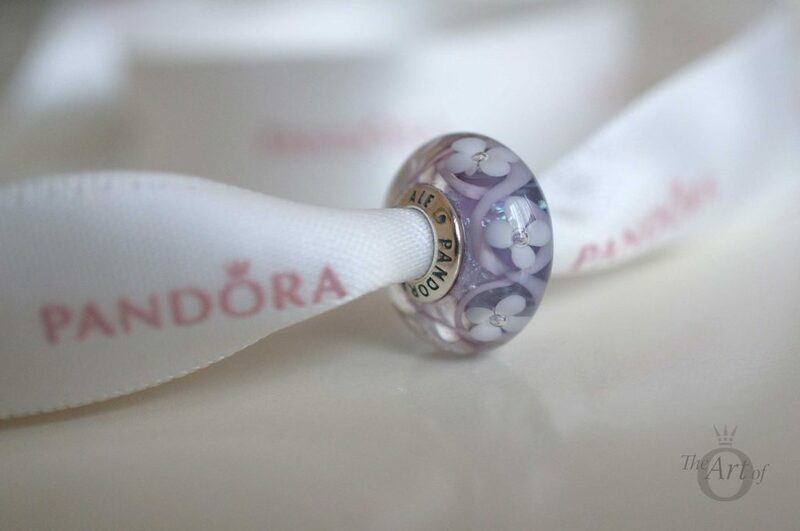 The PANDORA Magnolia Bloom Clips (N0. 792078PCZ) and Charm (No. 792087PCZ) make this quite a spectacular Spring style with little birds and hedgehogs hiding amongst the flowers. In this design I used the Darling Daisy Meadow Clip (No. 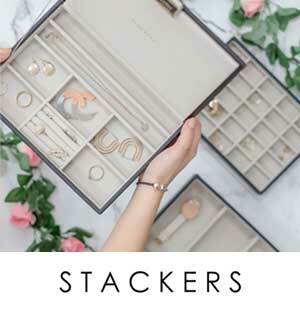 791494en12) and Darling Daisies Spacer (No. 791495en12) with the Field of Daisies (No. 791623) and Cherry Blossom (No. 790947) Murano Charms to create a beautiful botanic feast. 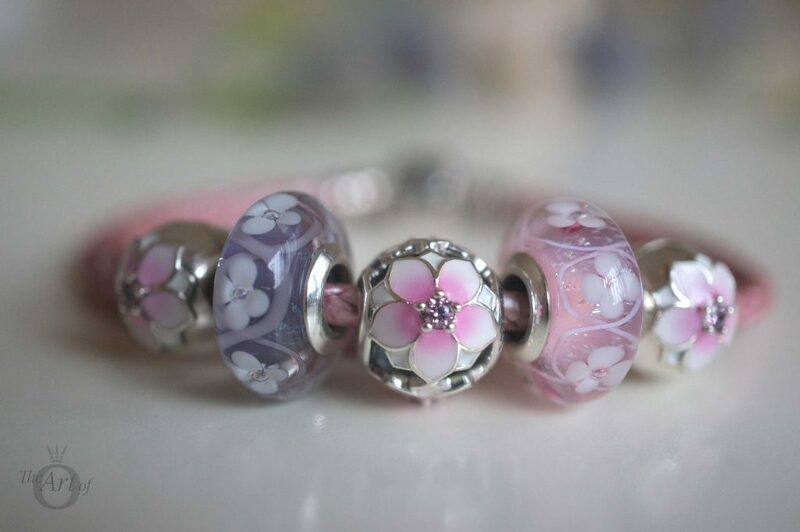 The subtle colours in the Field of Daisies and Cherry Blossom charms showcase the Field of Flowers Murano Charms, like bridesmaids with the bride and groom. 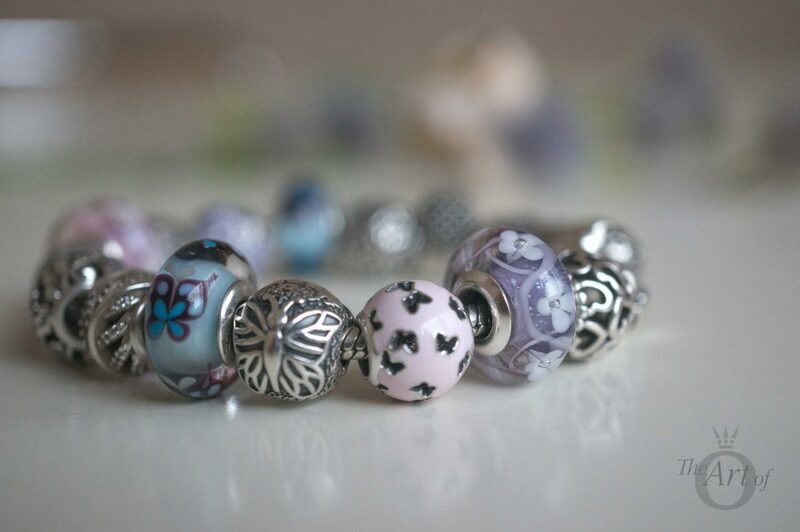 For a more muted style, I alternated the Field of Flowers Murano Charms with the Blue Butterfly Kisses Murano (No. 791622). 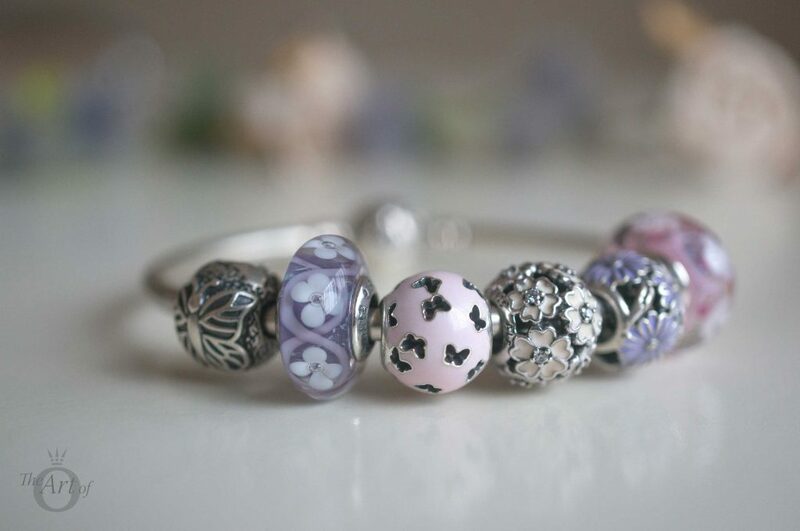 There are little pink and purple details on the hand-painted butterfly which tie this design nicely with the Pink and Purple Murano Charms. 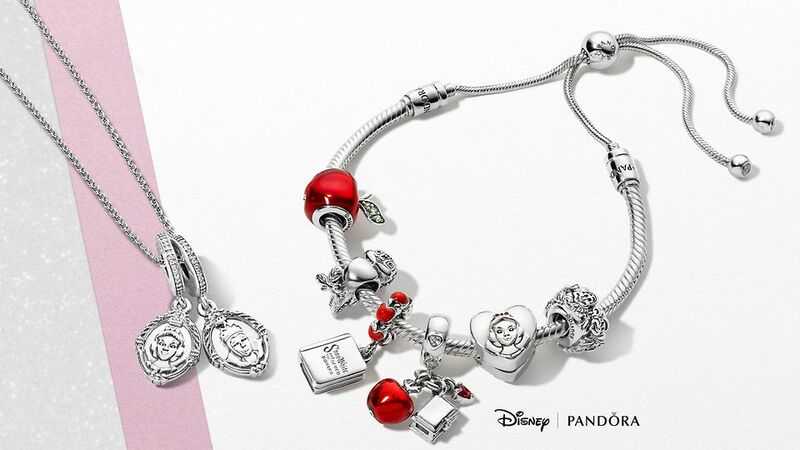 PANDORA leather bracelets are a great way to feature favourite charms. The Purple Triple Leather Bracelet (No. 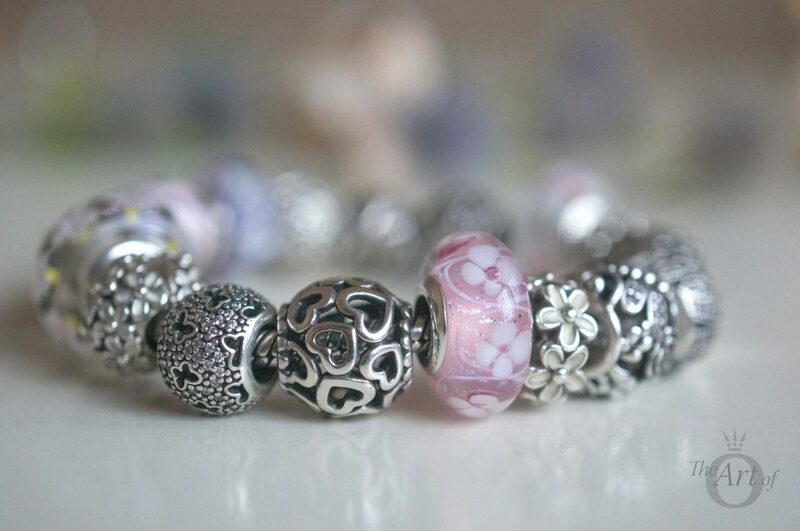 590714cpe-t) looks fantastic as a backdrop to the Field of Flowers Murano Charms. The oxidised detail on the Floral Heart Padlock Charm (No. 791397) gives the bracelet an antique, gothic feel. The Green Double Leather Bracelet (No. 590705clg-d) lifts the pink and purple Field of Flowers Murano Charms in this crisp design. The Darling Daisies Spacers provide harmony with the little white flowers in each of the Murano Charms. 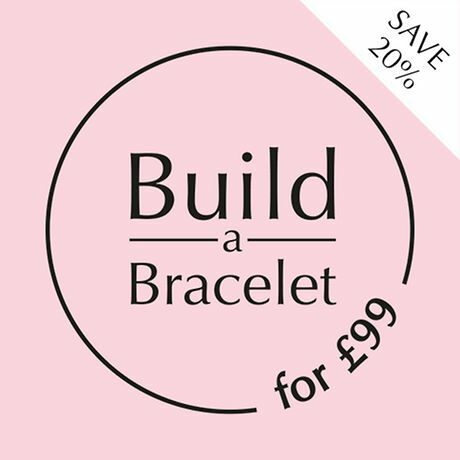 For more of a hothouse feel I used the Pink Double Leather Bracelet (No. 590705cmp-d) and the Field of Flowers Murano Charms with the new Magnolia Bloom Clips and Charm. 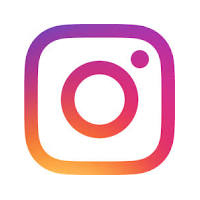 This is quite a simple design but full of vibrance and warmth. 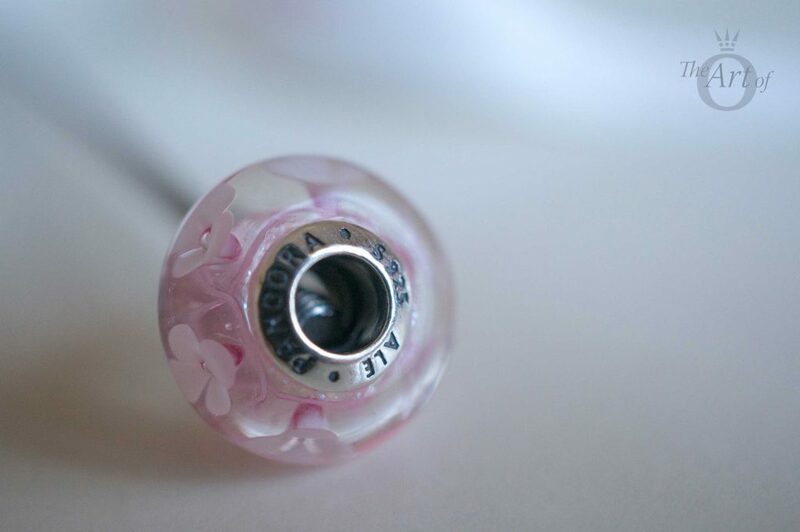 My verdict on the Field of Flowers Murano Charms? A perfect posy! The Purple (No. 791667) and Pink (No. 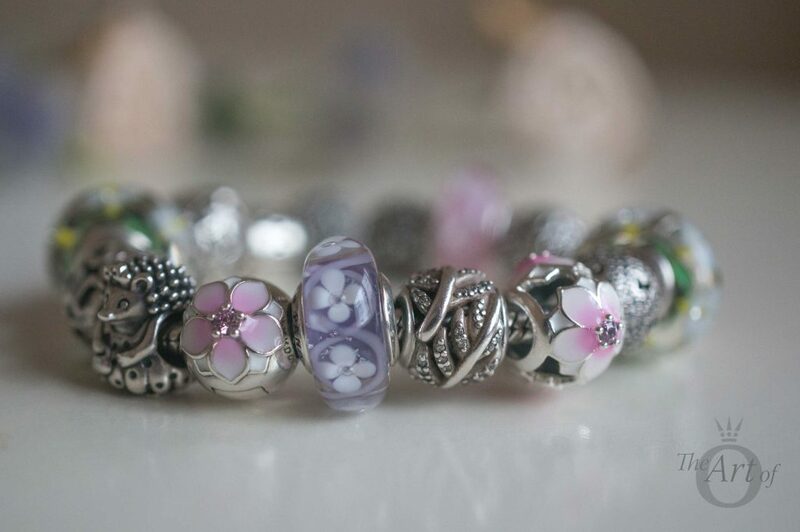 791665) PANDORA Field of Flowers Murano Charms are £40 / €45 / $50 / C$55 and are available from our preferred retailer BeCharming.com along with the rest of the PANDORA Spring 2017 Collection. 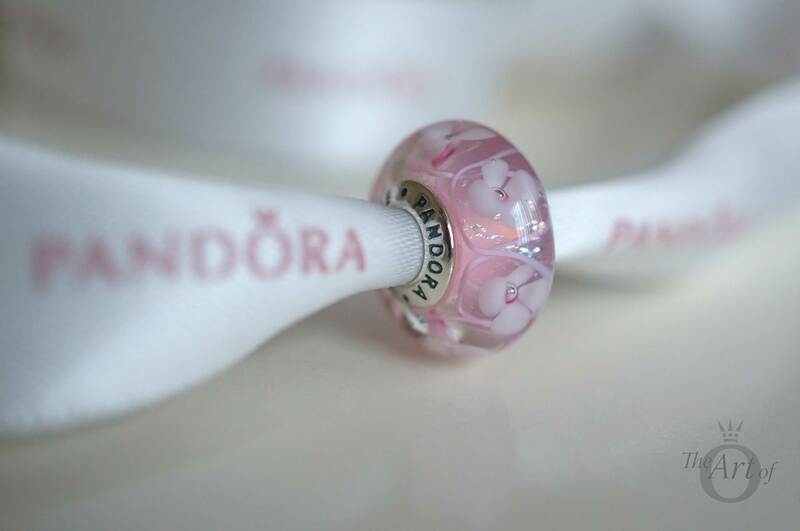 Do you have any of the PANDORA Field of Flowers Murano Charms? Which is your favourite colour? Let us know in the comments below. Lovely review of the pink and purple Field of Flowers muranos. Your last two designs are my favorites. It’s too bad the US didn’t get the blue. I think all three colors would make such a pretty spring bracelet. Looks like we’ll be getting the blue EIL charm, though. Looking forward to the release of the new open end bracelets in May. Think I’ll like them for mini designs. Your dedication and time you spend putting these lovely reviews together is much appreciated. Looking forward to more. It is a shame the blue Field of Flowers Murano isn’t available in the US. The blue version isnt my favourite of the three but I think they would look fantastic together. I’m looking forward to the different colours of the Encased in Love charms too as well as the Murano charms from the Summer collection. The new green shade looks gorgeous! I still have a few reviews to write as well as something different that I’m working on… Watch this space!